“Every athlete exercises self-control in all things,” noted the Apostle Paul in 1 Corinthians 9:25. The sportspersons among us can attest to this – regular training, proper nourishment, and good technique are mainstays of any athletic training programme, allowing them to build the right muscles and skill sets that enable optimal performance. “But,” Paul continues in 1 Corinthians 9:27, “I discipline my body and keep it under control, lest after preaching to others I myself should be disqualified” – drawing a clear link between the physical discipline exercised by athletes, and the spiritual discipline that Jesus’ disciples should exercise for their continued spiritual growth. What, then, are the factors that can help build our “spiritual muscles”? The DISCIPLE Bible Study course is one such “spiritual training programme” that can do so. It takes the form of weekly study and discussion sessions, provides solid study materials for spiritual growth, and trains participants to read the Bible by themselves and apply its lessons to their lives. 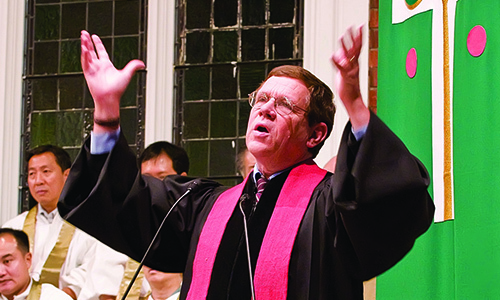 Bishop Wilke later had the opportunity to develop the DISCIPLE material as part of a ‘dream team’ of 18 pastors, theologians, laypersons, Christian educators, Bible scholars, publishers, editors, and marketers. 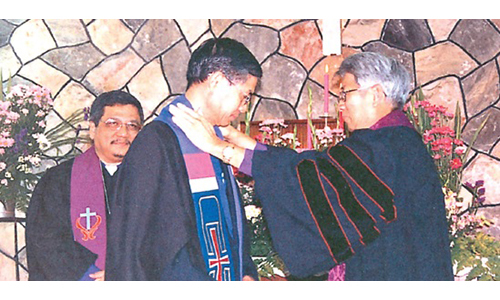 The programme spread quickly throughout The United Methodist Church in the USA, and soon reached Singapore’s shores in 1991. 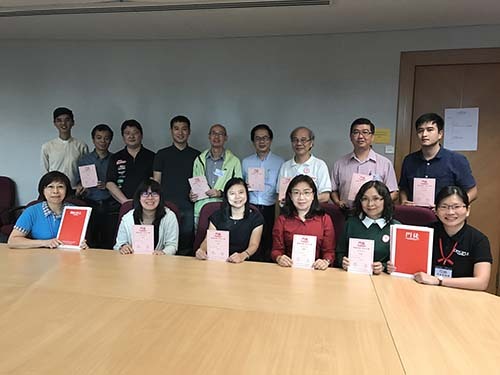 Shortly after, Disciple Agency (DA) was set up by The Methodist Church in Singapore, and secured an agreement to develop DISCIPLE in Cambodia, China, Hong Kong, India, Indonesia, Malaysia, Singapore, Taiwan, and Vietnam. 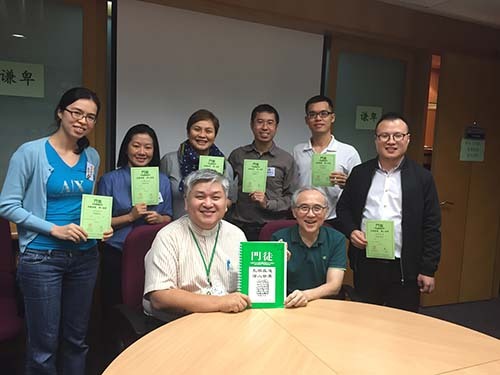 DA has since been instrumental in providing regional training in DISCIPLE, and translating the material into languages like Mandarin, Cantonese, and Bahasa Indonesia, which received special mention during DISCIPLE’s 30th Anniversary celebrations at the World Methodist Conference in 2016. What makes DISCIPLE Bible Study attractive as a discipleship programme for small groups? Firstly, it pioneered the use of video in Bible study – now a key feature in other programmes such as the Alpha Course. This enables small groups to “draw on the work of scholars to aid understanding of the Bible”. Invites persons to bring their experiences and struggles to Scripture. 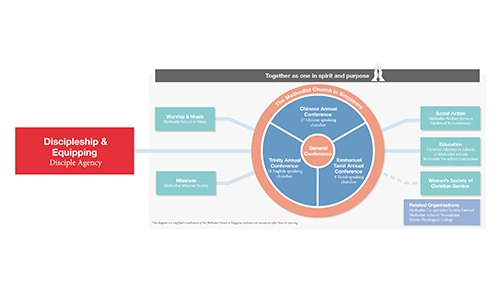 Apart from providing DISCIPLE materials and training, DA also offers other programmes for continued spiritual formation of Christian disciples, such as the Companions in Christ series. Its mission, after all, is “to build the Body of Christ through the promotion and development of the DISCIPLE Bible Study materials and other related programmes”. What better way to do so than through this regular, nourishing, and rigorous programme of spiritual training? Want to train up your “spiritual muscles” in order to “build the Body of Christ”? Enquire at your local Methodist church for their DISCIPLE course schedules, or contact Disciple Agency at 6478-4755.
is the Editor of Methodist Message. 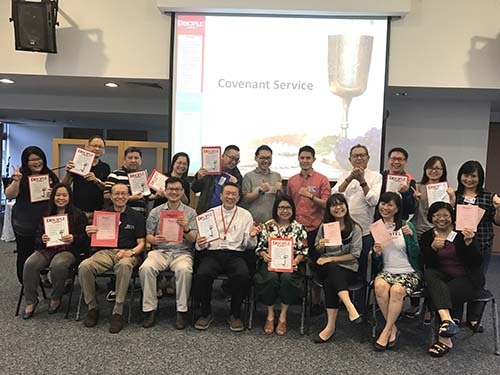 She put this article together with valuable input from the Rev David Gwee, Chairperson, and Ms Chng Siew Geok, Manager of Disciple Agency.